We are in a beautiful, heritage house that has managed to maintain its original character for over 100 years. The wide plaster cornices, ornate trims, leaded glass entry, gorgeous stained glass window and hardwood floors are all original. Telephone: (902) 492-2546 Calls are answered from 9 a.m. to 4 p.m., Monday through Friday. We are grateful to our clients for helping us protect the hardwood floors by removing wet footwear on the many sloppy days we have in Halifax. 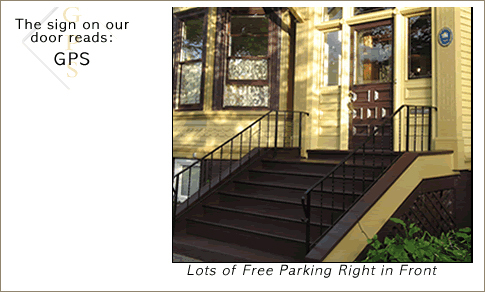 You’ll find free parking for two hours on our block and throughout the neighbourhood. The two parking places immediately in front of the building are reserved for those with handicapped stickers on their cars. In the event that there is no parking available in front of the building, there is a pay-for-parking lot, around the corner on South Street at Somerset Place.